Go to original pattern for design DROPS 113-31. DROPS socks in ”Merino Extra Fine” with cables. 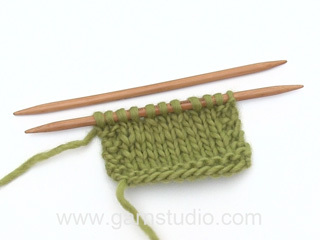 DROPS DOUBLE POINTED NEEDLES size 3.5 mm – or size needed to get 22 sts x 30 rows in stocking st = 10 x 10 cm. DROPS CROCHET HOOK size 3.5 mm – for picot border. Not sure which size you should choose? Then it might help you to know that the model in the picture is approx. 170 cm and uses size S or M. If you are making a jumper, cardigan, dress or similar garment, you will find a graphic with the measurements of the finished garment (in cm) at the bottom of the pattern. 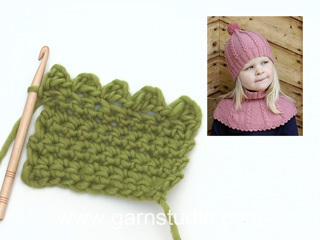 You can get the yarn to make this pattern from	9.30£. Read more. PATTERN: See diagram M.1. The diagram shows the pattern from the RS. ROW 1 (= RS): Work row until 8-10-12 sts remain, slip 1 st as if to K, K1, psso, turn piece. ROW 2 (= WS): Work row until 8-10-12 sts remain, slip 1 st as if to P, P1, psso, turn piece. ROW 3 (= RS): Work row until 7-9-11 sts remain, slip 1 st as if to K, K1, psso, turn piece. ROW 4 (= WS): Work row until 7-9-11 sts remain, slip 1 st as if to P, P1, psso, turn piece. Continue dec like this with 1 less st before each dec until there are 13-15-17 sts left on row. 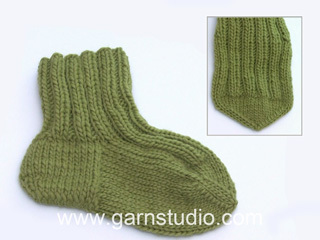 SOCK: Worked in the round on double pointed needles. Cast on 72-80-88 sts on double pointed needles size 3.5 mm with Merino Extra Fine. K 1 round and continue in rib, K3/P5. 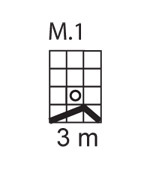 When rib measures 3 cm continue as follows: * M.1 (= 3 sts), P5 *, repeat from *-* 9-10-11 times (M.1 sits over K3 from rib). Continue like this until piece measures 8 cm. REMEMBER THE KNITTING TENSION! Now dec 1 st per pattern repeat across the round by P tog the first 2 sts in each P-section = 63-70-77 sts. Repeat the dec when piece measures 14 cm, but now P tog the last 2 sts in each P-section = 54-60-66 sts. When piece measures 18-20-22 cm slip the first 27 sts on a stitch holder (mid upper foot) and keep the last 27-33-39 sts on round for heel. 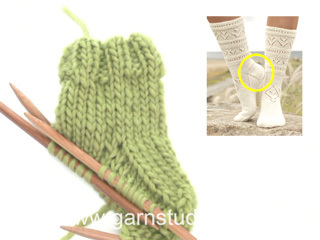 Work reverse stocking st back and forth on heel sts for 5-5.5-6 cm. Insert a marker in piece. Now dec for heel – see above. After heel dec pick up 11-12-13 sts on each side of heel and slip the 27 sts from stitch holder back on needle = 62-66-70 sts. Continue in pattern on the middle 27 sts as before and in reverse stocking st on remaining sts. AT THE SAME TIME dec each side as follows: P tog the last 2 sts before and P tog the first 2 sts after the 27 sts on upper foot. Repeat the dec on every other round a total of 8 times = 46-50-54 sts. Continue until piece measures 18-20-22 cm from marker on heel (= approx 4-4-5 cm remain). Now insert a marker each side with 23-25-27 sts on upper foot and 23-25-27 sts under foot. Continue in reverse stocking st on all sts, AT THE SAME TIME dec 1 st on each side of both markers by K2 tog before marker and K2 tog into back of loop after marker. Repeat the dec each side on every other round a total of 3-3-4 times and then on every round 6-7-7 times = 10 sts left on round. Cut the thread, pull through remaining sts and fasten. CROCHET BORDER: Crochet a picot border round the top of leg with crochet hook size 3.5 mm as follows, beg mid back: 1 dc, * 3 ch, 1 tr in the first ch, skip approx 1 cm, 1 dc in next st *, repeat from *-* and finish with 1 sl st in first dc from beg of round. Mallineuleen kuviossa taitaa olla virhe. Jos neulon M1:n mukaisesti, nurjan silmukkaraidan silmukat vähenevät kerros kerrokselta. Se ei liene tarkoitus. Hallo, werden die Ferse und die Sohle glatt rechts oder glatt links gestrickt? In der Anleitung steht nur "glatt stricken". Auf dem Bild sieht es nach linken Maschen aus, aber ich bin nicht ganz sicher. Herzlichen Dank. Liebe Helena, stimmt, Ferse und Sohle werden glatt links gestrickt. Viel Spaß beim stricken! Malli M1 on virheellinen: kavennat kaksi silmukkaa, mutta nostat vain yhden uuden eli joka kuvion kohdalla silmukkamäärä vähenee. Itse korjaan ohjeen siten, että teen langankierron myös ennen kavennusta. Suurimad tänud Tiina Otsla, 29.01.2015 kl. 08:35 tehtud kommentaari eest!! Mustri seletuses viga -1 silm kudumatta, 2 pr. kokku, tõsta kudumatta üle - peaks olema - 1 silm kudumatta, 2 parempidi, tõsta kudumatta üle. Nn. "valepalmik"
Tere, muster on superilus aga mul tekkis üks küsimus. Kui ma mustri esimest rida (tõsta 1 s kudumata, 2 pr kokku, tõsta kudumata silmus üle) koon, siis jääb mul sellest reast järele 1 silmus. Kuidas ma järgmisel real õhksilmuse kahe silmuse vahele saan sellisel juhul kududa? Suur aitäh vastamise eest. Silmuste arv peab jääma mustris samaks, seepärast tuleb ühel real kokkukootud silmus taastada järgmisel real õhksilmuse tehes. Kuna kootakse ringselt, siis läheb muster sujuvalt üle uuele reale. Põhiline on jälgida et muster ikka kenasti kohakuti jääb, mitte ei nihku ühele või teisele poole. Missä kohtaa sinulla on ongelmia ohjeen kanssa? Hej! Det står inte" sticka SAMMAN" utan bara "sticka". Når man i mønstret på 1.p tager 1m løs af, strikker de 2 næste sammen og så trækker den løse m over, så har man kun 1 m. På 2.p skal man slå 1 m op ml de 2 m. Men der er jo kun 1 m. Der må være en fejl i forklaringen til mønstret. Du strikker ikke de 2 sammen.... Du strikker således: tag 1 m løst af p, strik 2 m ret, løft den løse m over. With over 30 years in knitting and crochet design, DROPS Design offers one of the most extensive collections of free patterns on the internet - translated to 17 languages. 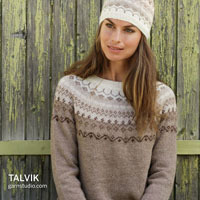 As of today we count 242 catalogues and 8808 patterns - 8800 of which are translated into English (UK/cm).